The boxing event the world has waited six or seven years to see is finally (most likely) going to happen. According to Top Rank’s Bob Arum, Manny Pacquiao’s promoter, the Pac Man has signed on the dotted line to face Mayweather on May 02nd in what will surely be the richest fight in the history of combat sports. Although Arum declined to comment on the venue, pay, and other specifics of the fight, a source close to Showtime boxing or HBO boxing stated that the purse split was going to be 60/40 in Floyd’s favor. The expectation is that the fight could cost $100 on pay per view and be expected to do in excess of 3 million buys. Both pro boxers would be in for a payday unlike anything the world has ever seen. Ringside boxing seats will cost over $5,000 simply for the fact that the fight is so coveted and this will truly be a historic event. In order to generate a $40 million gate at the MGM Grand Garden Arena, all ticket prices will be sky high. Those betting boxing will want to place their wagers soon since rumor has it that Mayweather might open as a 3:1 favorite but those odds are sure to become more acceptable as time goes by. 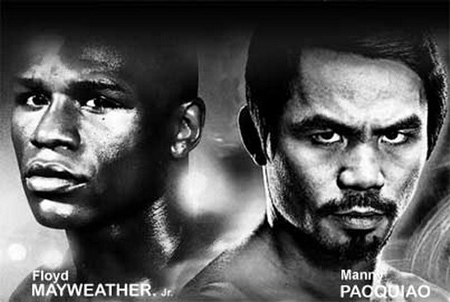 Sports betting is always popular but this fight will probably bring it to never before seen heights! Although Mayweather’s people have also agreed to the terms of the fight, it is Floyd Mayweather, Jr himself who has yet to sign to fight Manny Pacquiao. The world is watching, Floyd!! If you’re really not scared, sign on the dotted line. Make the fight happen. We will report out the details as we get them. Will Floyd Mayweather finally put his money where his mouth is and face Manny Pacquiao in the ring? If so, who do you predict will win? Please share your comments below.